I am not sentimental...I am symbolic, often traditional, with the sense of an ongoing treasure hunt. I am always looking to create or find hidden meanings. Which is why I probably spend so much time analyzing other people...what they say and do, expecting that there must be something mysterious or unsaid. Then weeks later come to the conclusion that they meant specifically what they said and nothing more. If you are the allegorical type like me and enjoy interesting and symbolic undertones you will like this last bridal idea I will be sharing with you this year. If you have been reading along this blogging journey of mine you know just how special my Gran was to me. When we first sat down to begin planning our wedding my husband and I immediately wanted to add special reminders of our late grandparents that had been such a cherished part of our upbringing. I had pictures of both my grandmothers on their wedding day and began to think, "What could I do with these?" Outwardly, for our guests to see our parents lit a candle for each of their late parents, my husband carried his late grandfather's cowboy hat as he seated his grandmother, but I wanted to do something in honor of my grandmothers that was a personal, less noticed demonstration. 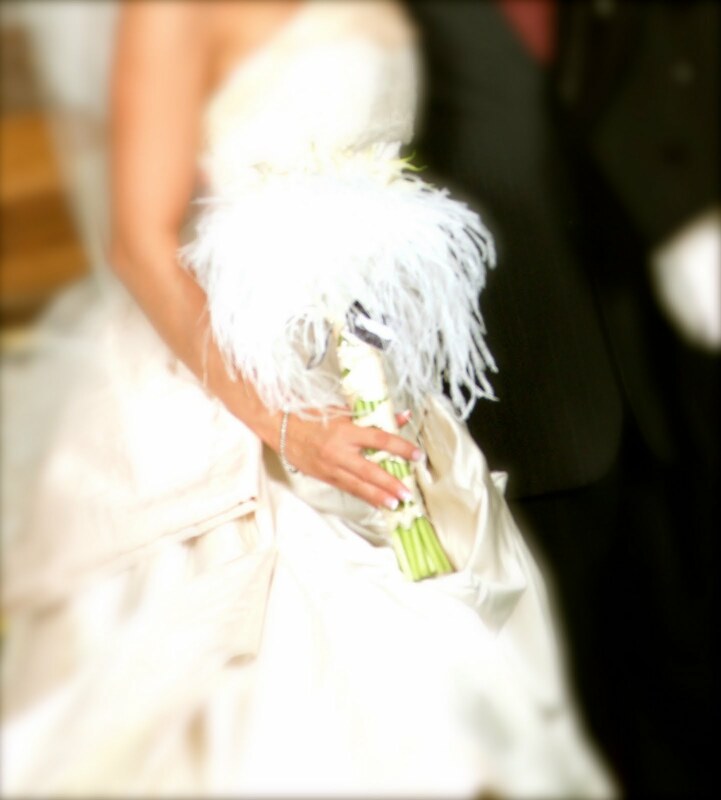 This picture does not do my bouquet justice; however, it does illustrate my idea I am sharing with you. I suppose I must not have given the florist very precise directions because I would have accomplished this differently. (Really, the last couple weeks before our wedding I do not remember much other than I kept crazily plugging away at all the last minute things. It was probably the most stressed I have ever been.) 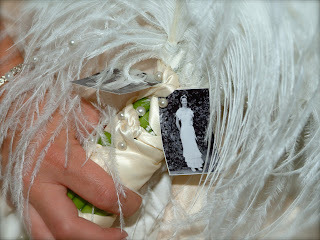 As you can see floral/quilter's pins were used to secure the pictures in place. What I do not like is that you can barely see my Gran's picture because it is pinned over the knot in the ribbon. If I were creating my bouquet, which I am glad was not then, I would place the center of the ribbon at the bottom of the stems, begin wrapping it, placing pins or tying where the ribbons criss-cross until reaching just under the blooms. At that point I would knot the ribbon tightly, placing a pin in the center of the knot to secure it to the stems. This was a thick ribbon so there are a couple options to attach the photographs. Before securing the knot, slide a smaller ribbon through the knot then pull the knot tight, allowing the ends of the smaller ribbon to hang independently of the large ribbon. Punch holes in the tops of the pictures, thread the ribbon through and knot in back. Or glue the pictures directly to the large ribbon ends hanging from the knot. Either would be visually pleasing, given you are close enough to see. As always, this is applicable to more than just brides. Let's see, what are some other good functions for this project? What about people in the hospital? People can wind up in multi-night stays in the hospital for a range of reasons. If they are crazy about their pets like I am they would love to see a picture of their little animal attached to a bouquet while they are apart. Moms? Grandparents? Maybe the kids are leaving for summer camp or even college. Their child's/grandchild's picture attached to a floral arrangement would be very special. There is always more than one use for good ideas and more than one way to do them. Think of something special to you or someone you care about, give it your best designer's eye and get creative!